The I Don’t Feel Like Going to the Store Frittata (with bacon!) | I Am Not A Restaurant! Preheat oven to 375. In medium non stick pan melt a knob of butter with a small pour of olive oil over medium heat. Don't be stingy, it helps release the eggs later and adds flavor. Slice the potatoes and give them a good stir around with salt and pepper. While they take some color, whisk the eggs with 1/4 teaspoon salt, a few grinds of pepper, bacon and cheese. Add eggs to potatoes, redistribute the lumps and bumps, then let set and pop in oven. When cooked through (10-15 min), broil so cheese bubbles on top. Serve with salad and bread. Optional add-ins: sautéed onions, shallots, mushrooms, peppers. It's all good. 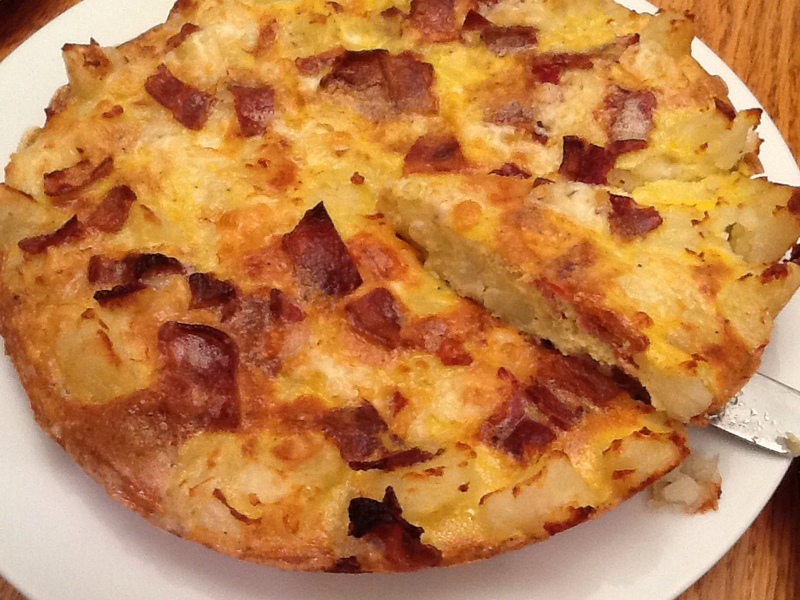 Dec12December 12, 2013 • By Betsy Karetnick • This entry was posted in dinner, Dish of the Day, Kitchen Help, Recipes and tagged bacon, eggs, fritatta. Bookmark the permalink. ← I Found the Challah! The only thing that makes me happier than throwing together a frittata on a weekday night is someone else throwing together a frittata on a weekday night!! Perfect for a cold Thursday evening-thanks! !